Got 5 minutes, a coke can, and a pair of scissors? If so give this little stove a try. It is easy to make, and uses only one can. Also, the pot sits right on top, so it doesn’t need a pot stand. Just add a piece of aluminum foil for the wind screen & you are good to go. The YACC stove can raise a pint of 65*F water to 135*F using 1/4 oz of alcohol when air temperature is around 65*F. I have found this sufficient for my lightweight ‘cooking’ needs. A 4oz supply of alcohol lasts me for 16 stove firings, which equates to 4 gallons of ‘hot’ water. Of course, if you need more heat, you can add more fuel. The stove was inspired by the Antigravity Gear stove (uses two cans) and “The One Can K.I.S.S. 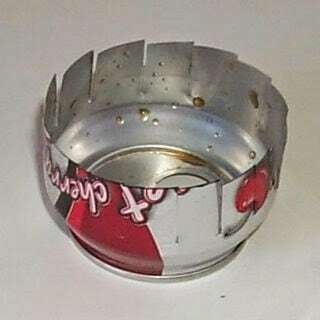 Soda Can Stove” by DeoreDX on the TLB Forum. 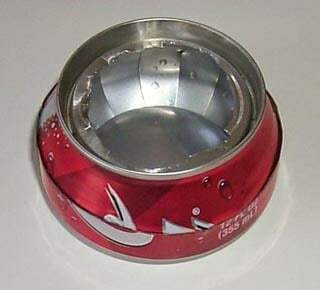 I liked the idea of using just one can, and wanted construction to be as easy as possible. The YACC stove can be made quickly with just a pair of scissors. 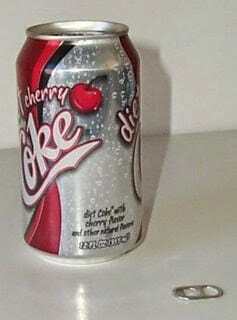 Here’s how to make it: Obtain an aluminium soda can. Remove the opening tab from the top, and tear the top out with a pair of pliers, or cut out with can opener..
Mark the side of the can 3/4″ up from the bottom. 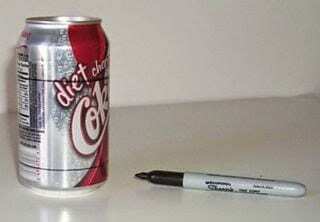 Flip the can over and mark the side of the can 1 1/2″ from the top. Now, carefully cut along the marked lines. If your marked lines are on the ‘thick’ side, cut the bottom along the outside of the line (thus making the bottom slightly larger). Take the top section and cut slits every 1/2″ from the cut edge to just below the shoulder of the can top. Push the tabs slightly toward the center and slide the top section into the bottom section. Push the top (carefully) all the way down into the bottom. The tabs of the top will follow the can bottom until they jam up against the domed part of the bottom. As the shoulder of the top starts to go under the cut edge of the bottom, look for bulges that might tear the bottom and push them inward with the flat side of the scissor’s blade. When fully seated, the top’s shoulder should be slightly under the bottom lip. None of your slits should be visible from the top. (If they are, you will need to cut another top.) Hold the can together and roll the cut edge of the bottom slightly inward over the top’s shoulder to hold the stove together. If the details above sound too tedious, just push your two stove halves together. At first, your stove will spring up so that the top slits are exposed. Don’t worry, because after you light the stove, you put the pot on, which will compress the stove anyhow. After using the stove a few times it will stay compressed (particularly if there was a little soda left in the bottom). Now that you see how it goes together, how does it work without any gas jets? Well actually, the jets are there, but hidden under the cut-edge of the stove bottom. All those cuts in the top allow gas to pass through which find their way out the small gap between the can top and bottom. So, in the end you have a two wall (well sort of) stove that is pressurized (again, sort of).